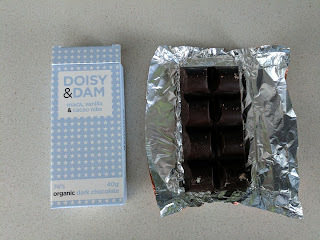 Doisy & Dam is a UK based chocolate maker. Their tag line is that they make "superdelish" chocolate, that is, chocolate that is healthy, with minimum 8% superfoods, but also tasty. The company is named after two scientists who won a Nobel prize in 1943 and studied health and nutrition. The bars are all organic, gluten-free, soy free, etc. 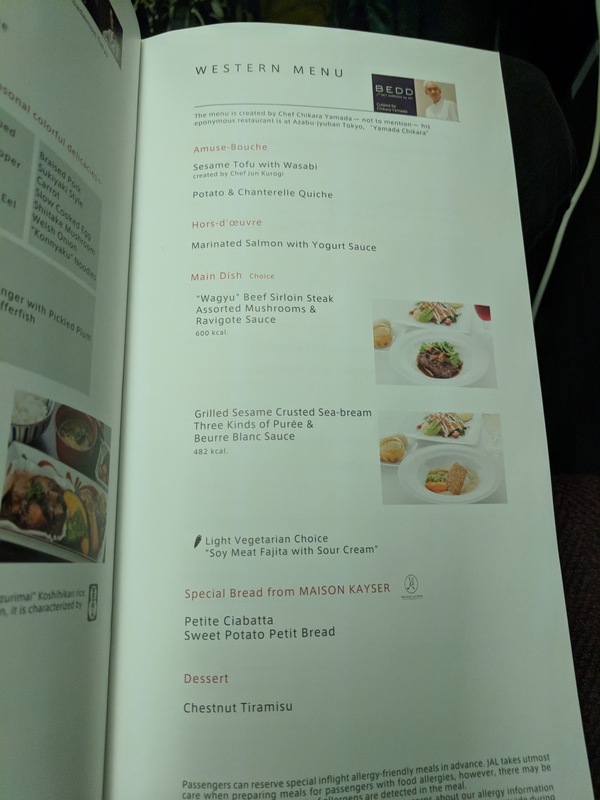 I believe I discovered their goods on a flight, perhaps Virgin Atlantic? I didn't seek them out, but, once I had a new chocolate in front of me, I obviously had to try it. The list of chocolate bars Doisy & Dam makes does not read like any other chocolate selections. Goji & orange. Mulberries, black sesame, & spirulina. Quinoa, smoked tea, & vanilla. Coconut & lucuma. The list goes on and on, with hemp seed, poppy seeds, sprouted buckwheat, dates and many other healthy foods in the mix. Some are 74% dark (and vegan), others 39% milk, and one is white chocolate. The bar I picked was the least crazy sounding of all their varieties though - maca, vanilla, & cocoa nib. Maca obviously isn't standard, but, the others seemed fitting for a chocolate bar. Maca, vanilla, & cocoa nibs. "This vegan chocolate perfectly balances the bitter chocolatey crunch of cacao nibs with the sweet vanilla, finished off with a kick of maca root to give you an extra boost! Doisy and Dam are taking the yawn out of the phrase ‘healthy chocolate’, creating indulgent vegan chocolate bars which will more than satisfy your cravings." The packaging was a bit different, a bar-shaped box that you needed to open, and then the bar itself was wrapped in foil. Once unpackaged, I found a shiny dark chocolate bar made of 8 distinct chunks. I broke one chunk off. It did not have a nice snap to it. I tasted it. The texture was rather chalky. The flavor was ok, very ... fudgey, like a rich brownie perhaps. I did like the crunch from nibs. But for me, the texture ruined it. I shared some with co-workers to hear their reports. The verdicts? "It was chocolate, it was good." "Thumbs in the middle, it is fine." My 2017 visit to Tokyo featured a lot of ice cream. Soft serve ice cream. One of my favorite things, something San Francisco doesn't do well, but, it turns out, Tokyo does. In particular, Japan seems obsessed with soft serve made from Hokkaido milk. Undeterred, we ventured back the next day, after getting takoyaki at Gindaco, and this time, we were sure to arrive before 8pm. My group of 5 all ordered different items, each quite stunning looking. All featured the same wonderful soft serve. I will attest, this is good soft serve. This is soft serve that they spent 10 (!) years developing, named "Cremia". They wanted it as creamy as possible, like eating frozen whipped cream, but, without coating your mouth all gross. The result is soft serve that is 25% cream. Normal soft serve is 5% (up to 8%, and very, very rarely 10%). This was 25%!!! And, again, it was awesome. The treats were also all presented beautifully. Uh, was the place just for women? Because I brought a group of all dudes. 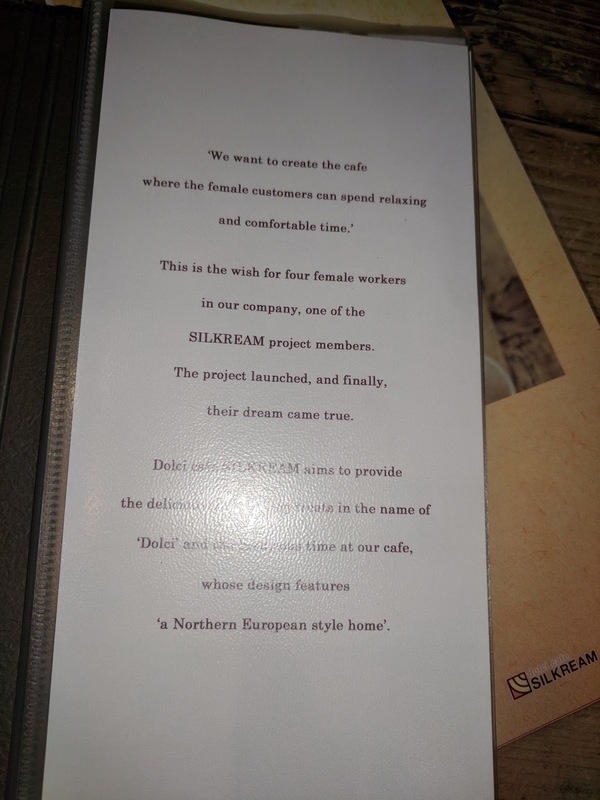 “SILKREAM” was born from the ambition of four young women.Enjoy a pleasant and quality time for you. Drop in to DOLCI Café “SILKREAM” when you feel tired during your trip. We will warmly welcome and give you a comfortable time even for a short rest.The intimate space you can find nowhere else is waiting for your visit." I guess this does rather sum up the cafe. Very cozy, very relaxing, actually. Soft music played in teh background while we were there, adding to that atmosphere. As I mentioned, one option is takeout, where you can get a cone, a vanilla cone (vanilla *isn't* the standard flavor in Tokyo, just "milk" is), or a chestnut parfait. Chestnut was everywhere. Prices for takeout were much cheaper than inside seating. Inside the cafe is an open prep area, where I could watch each item being assembled. The service style was interesting, each item was made in serial order, and brought out once ready. 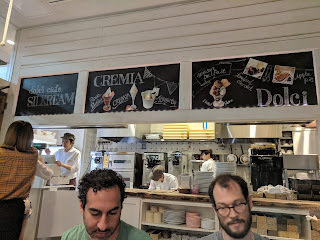 Since it was ice cream, and melting, waiting for the whole group to get their orders wasn't really the right thing to do, but the time between the first and last dishes hitting our table was at least 15 minutes (per the timestamps on my images). I don't really know how to describe the decor. Country cottage perhaps? 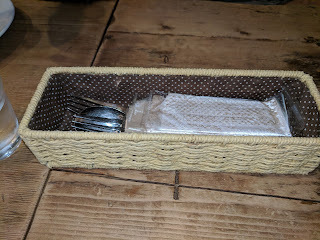 Baskets of cutlery were provided once we ordered. 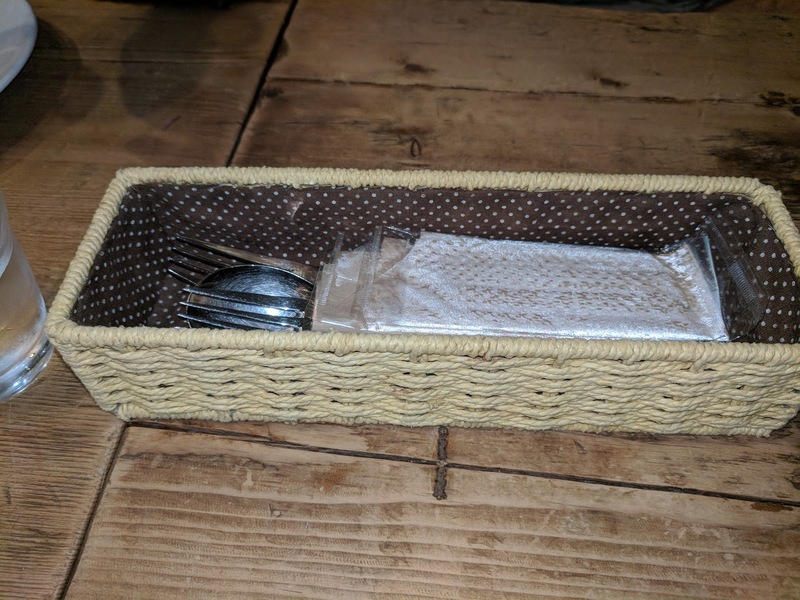 It seemed strange that napkins were individually wrapped in plastic. Silkream offers more than just ice cream, including savory dishes like salads and noodles, a large drink selection, and crepes. But, the dessert lineup is clearly the main attraction, all of which feature the signature soft serve. "Creative frozen desserts of soft serve ice cream decorated with fruits and sweets." The first page tells us all about how the owners wanted to create somewhere relaxing. The english menu was well illustrated. 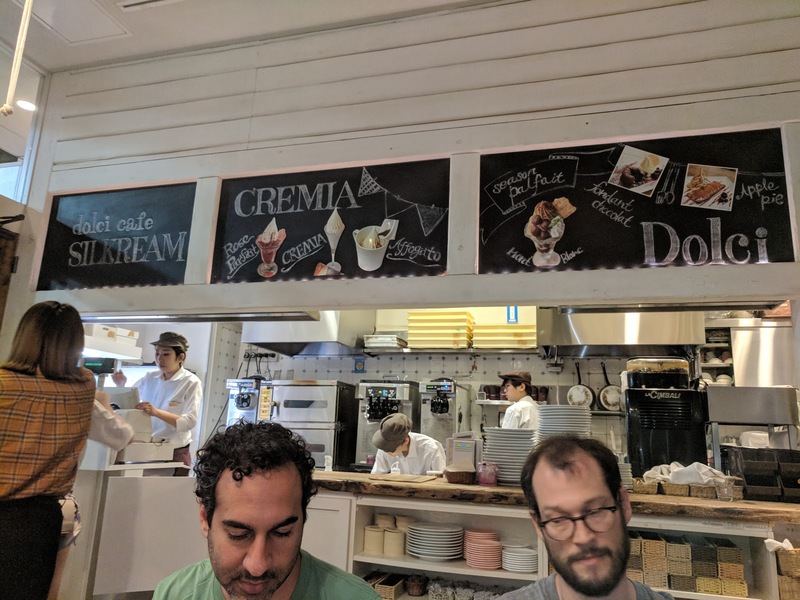 We ordered 3 of these 4 items, skipping the affogato. 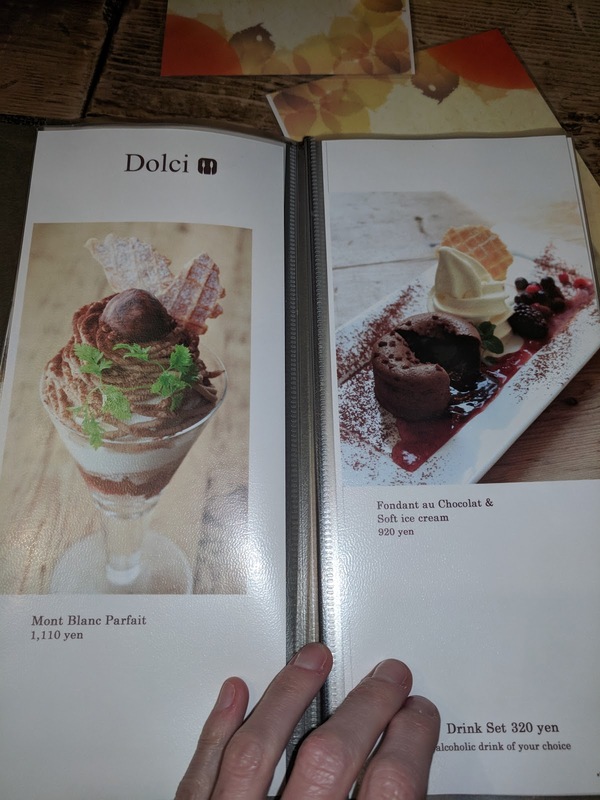 The next page had some stunners, a parfait and molten chocolate cake. I'm shocked no one got the cake. The apple pie got its own page of the menu, but, no one in our group ordered it. 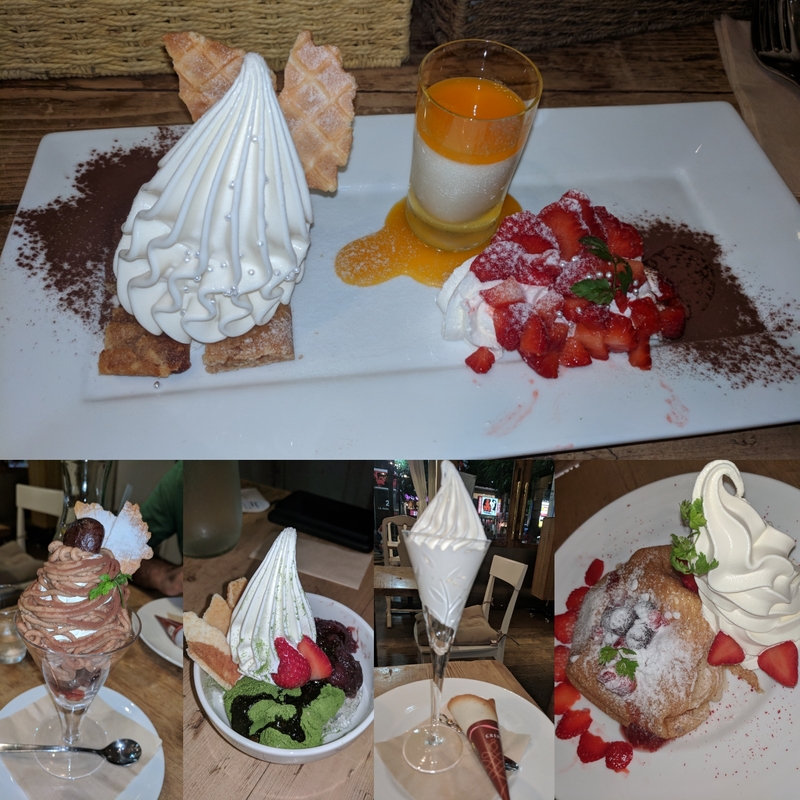 The final dessert items were crepes, three varieties, all different styles. We ordered 5 different items, a nice sampling of the dessert menu. Cremia with Panna Cotta. 980 yen. 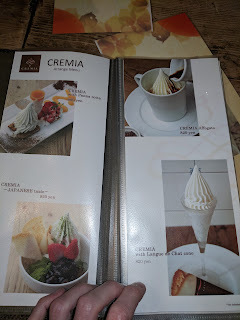 I opted for the cremia with panna cotta. I don't think of panna cotta and soft serve ice cream as items that belong together at all, but, I do like both so this seemed like a great way to hedge my bets. Plus, I couldn't just get the ice cream! The soft serve (left side of platter) came perched on almond biscuits, had silver balls decorating it, and waffle wafers sticking out. I adored the biscuits on the base, crispy, buttery, great flavor, nice crunch from the almond chunks. My favorite element, actually. The soft serve was indeed ridiculously creamy and very rich, yet without tasting like you were eating just cream. It was very good. The flavor wasn't vanilla, it was a bit tart, but sweet, and I guess, "milk" flavored? The texture of both the ice cream and the biscuits is what really stood out to me, both excellent, and complimentary. I also liked the crunchy silver balls. The wafters sticking out were just standard waffle cones, but they were sweet and another crunchy element. In the glass is the panna cotta, fairly classic, thick, well set creamy panna cotta, topped with very sweet mango sauce. Too much mango sauce. It was ok, but, I had been having multiple pudding desserts every day in Tokyo, and perhaps I was kinda sick of it? Or maybe it just wasn't anything special? I found it hard to be excited for. Plus, um, ice cream! The ice cream *was* special. On the right is a mound of fluffy whipped cream, with fresh strawberries, and more pearls. This was all fine, but again, not the most exciting thing on the platter. Overall, this was just a bit strange. Why ice cream, panna cotta, and whipped cream, all on one dessert? They didn't go together. 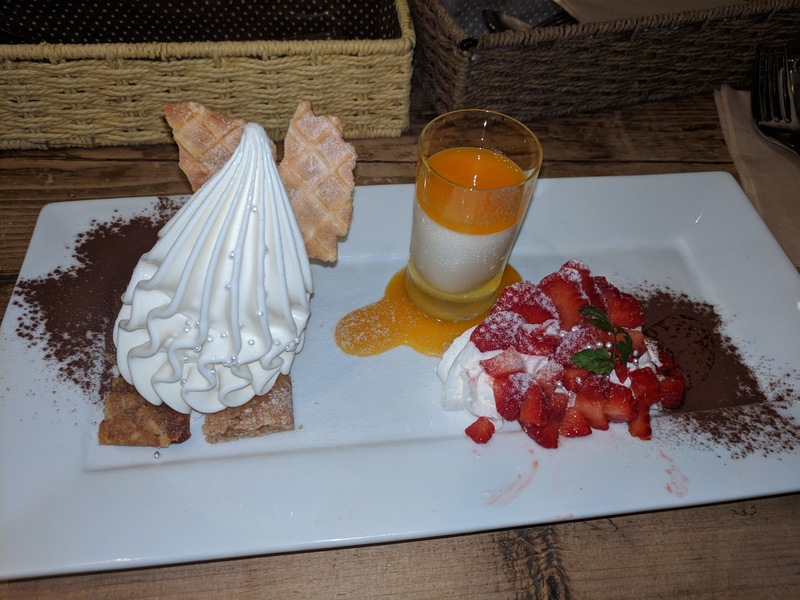 I still loved the ice cream, and the crispy almond cookies, so I'm glad I ordered this, but still, a bit of an odd platter. Cremia with Langue de Chat cone. 820 yen. 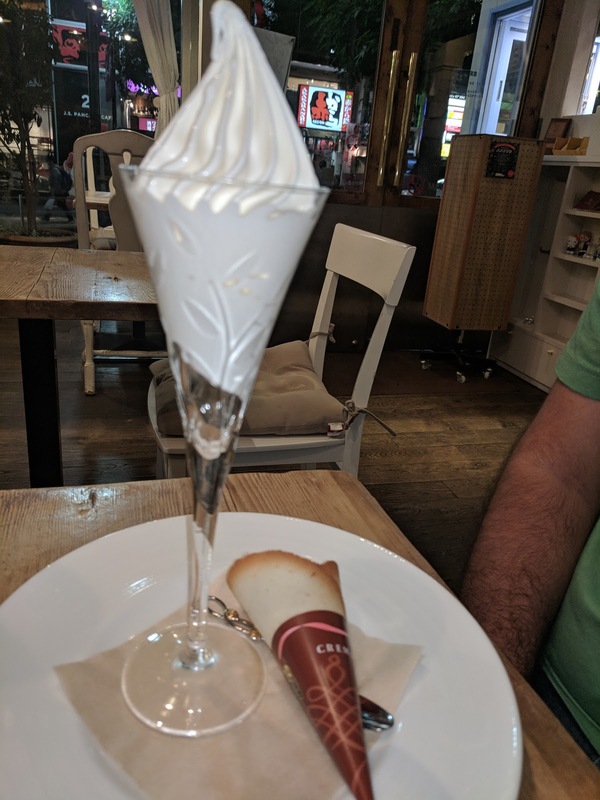 One person went quite simple, just a parfait glass of the ice cream, with a cone on the side. A special cone, that just like the soft serve itself, they also spent years formulating. They wanted something actually tasty, but that would hold up. This is basically a thin rolled buttery sugar cookie. It was very good. Note that it wasn't served in the cone, as that wasn't allowed since we were dining inside, because that is messy. Had we been outside, it would be served in a cone (and cost less!). The cone was actually better than regular cones, a crispy wafer, sweet, buttery. But so strange to have on the side. This diner probably liked his the least, but, he really picked the most boring offering. Mont Blanc Parfait. 1,110 yen. 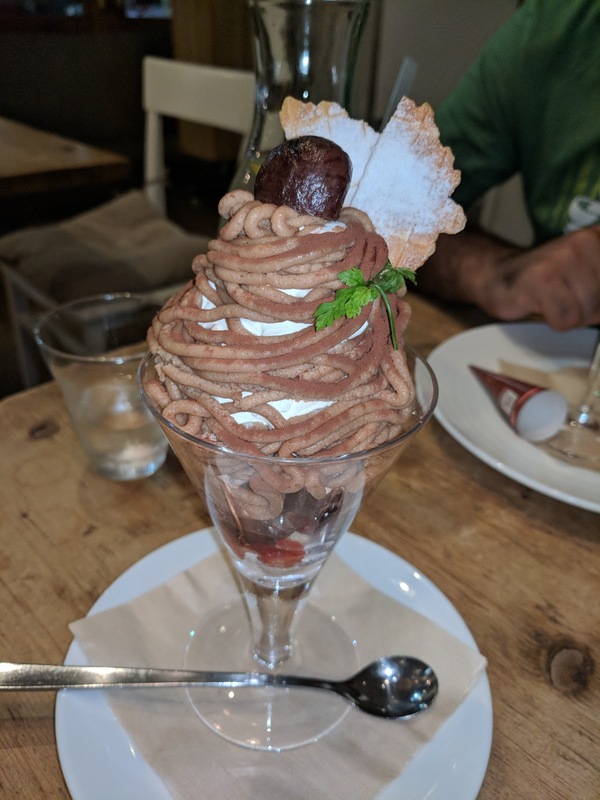 Mont Blanc, and chestnuts in general, are a rage in Tokyo. I don't know if this is seasonal, or what, but, they were everywhere (I had an amazing mont blanc ice cream myself a few days later). This dinner clearly "won" the best looking, more elaborate one, with the chestnut cream spaghetti-like wrapping, chestnut on top, crispy wafers sticking out, and layers of interesting things amongst his soft serve. More expensive than the other items, which seemed warranted given how much more involved the prep was. "Made from whole wheat to keep its nutritional value and natural flavor." One diner opted for a crepe, the strawberry ones. This one was quite the surprise, as it was stuffed with ... cake? He didn't seem thrilled with this fact. 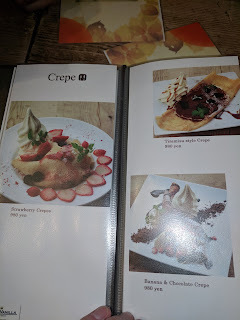 Other crepe options were "tiramisu style" and banana & chocolate. 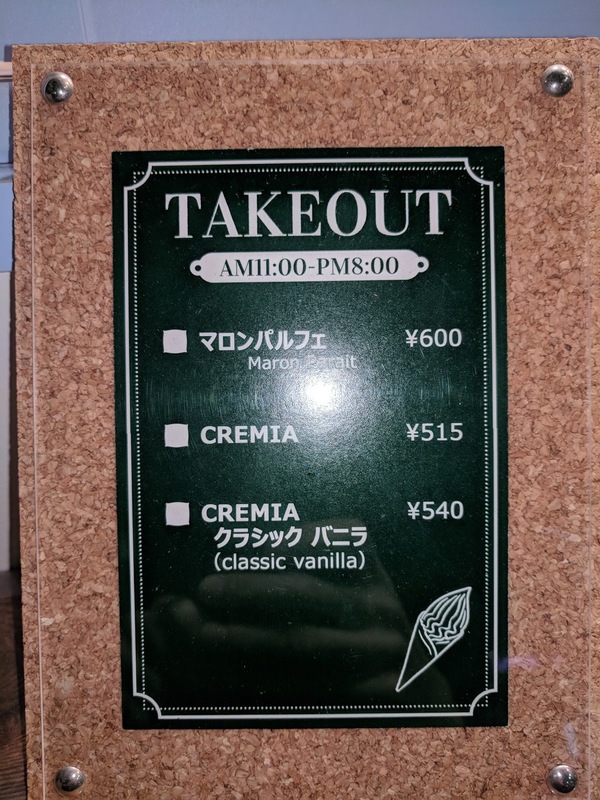 Cremia Japaese Taste. 920 yen. 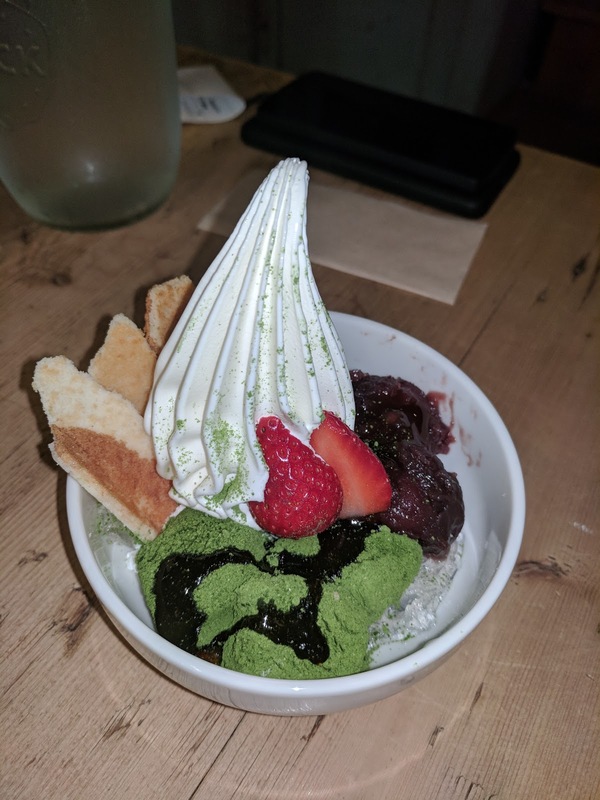 The Japanese style had green tea mochi, sweet red bean, matcha powder, and strawberries, along with crispy wafers. It was actually quite small in comparison to the other offerings. If it wasn't evening, I likely would have opted for this, but, I didn't want green tea at night. 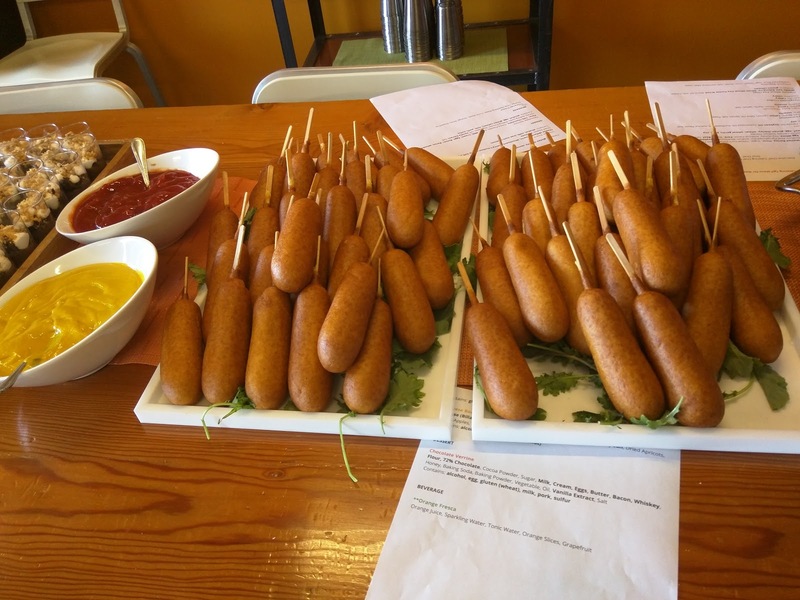 I've shared my feelings on waffling just plain hot dogs before, but of course, I've also tried waffling corn dogs. Many times. Because, well, it works. And corn dogs are awesome. And I often have extra corn dogs. The originals are generally State Fair brand corn dogs. 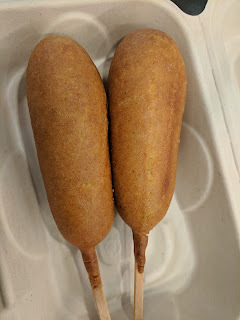 Classic corn dogs. Honey batter corn bread coating, turkey/chicken/pork dogs inside. They are good in their regular form of course (best when fried! ), but what do you do when you have extras? No one wants a cold corn dog. You thought I was going to say waffle them, didn't you? Well, I was, but it turns out, I don't have any photos of the ones I waffled. I'm not sure why. I think I get too excited about my corn dogs to wait long enough to take a picture. But believe me, it works: the outside gets crispy, inside warms up. One time I used the grill plates of my waffle iron instead. That worked too, perhaps better, as the iron had more contact points, and thus made lots of crispy bits, which I really liked. 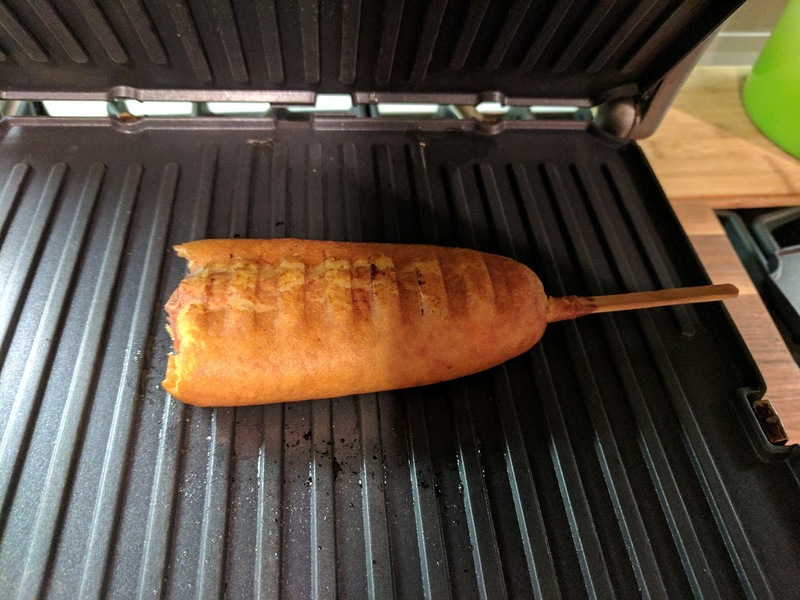 So overall, yes, a fine way to re-heat a corn dog, but, it didn't really transform it. 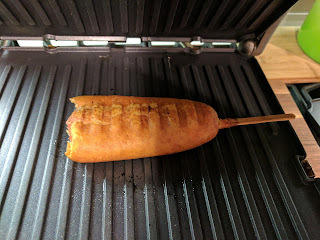 Besides having satisfying crunch from the contact points, this was no different from a baked corn dog. One day, I decided to get more creative. My goal was to make, uh, corn dog croutons, that I could throw on top of my salad. I'm not sure why I thought this sounded awesome, but it did, so I wanted to do it. So, to answer the new question: Waffled Corn Dog Slices, Will It Waffle? YES! Much better than a full size corn dog. So much crispy. This was pretty simple. 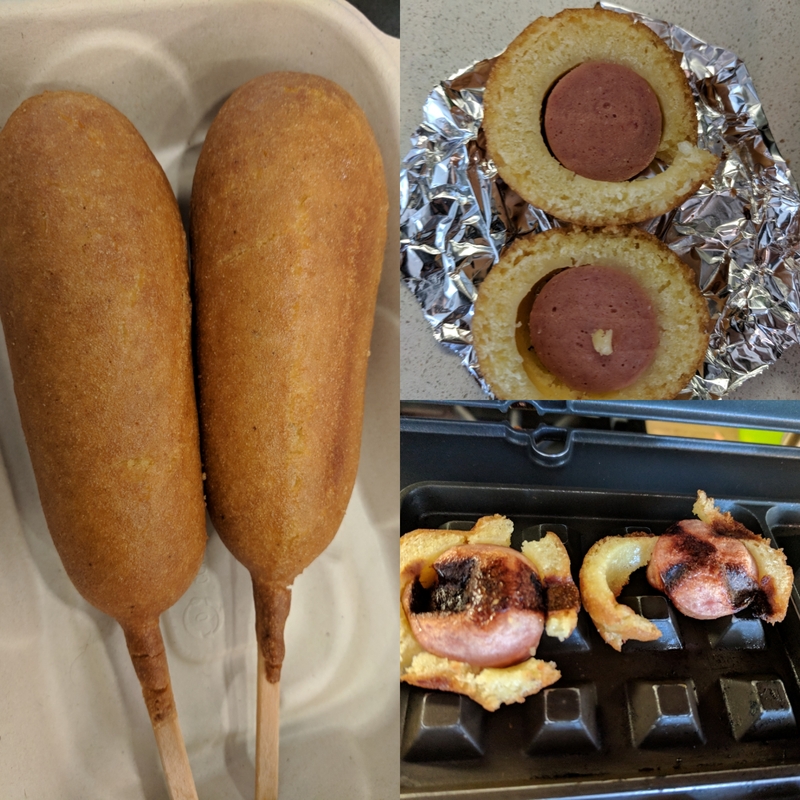 I took a leftover corn dog, removed the stick, and cut it into slices. Into the iron they went, 350 degrees, pressed down hard. A few minutes of sizzling later, and they were ready to go. They came off the grill easily, although, suffered a bit in that the batter did separate on some. Besides breaking apart a bit, these were a total success. Both the hot dog and the corn bread wrappers got crazy crispy, just like, well, croutons. I threw some on top of my Caesar salad for protein (total justification for eating hot dogs, right?) and crunch. The next day, I did another batch, not to put on salad, but just to eat, so not left in quite as long as I wasn't trying to make croutons. 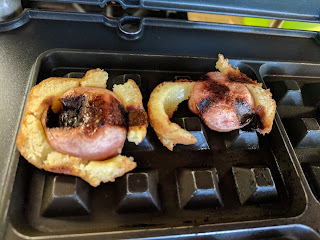 I still let them go long enough to really crisp up the cornbread and the hot dog though ... this is perfect for those who love to cook hot dogs until they split wide open (which, uh, I do). I ate them as finger food, dunked in ketchup, mustard, relish, and mayo as I pleased. I really liked the fun eating factor of the slices, and honestly think I might just do this with leftover corn dogs from now on. Complete success, as a snack, or, uh, a crouton. 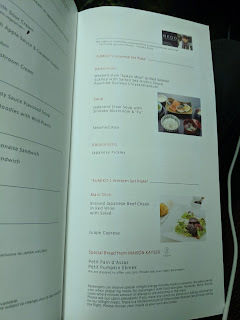 My return flight to San Francisco was the same aircraft, same service style as my flight to Tokyo. This time, I was in the main business cabin, and greatly wished I had been able to snag a seat in the mini cabin. 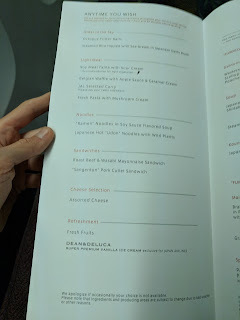 Service took forever to get started, more than an hour into the flight and our drink orders hadn't even been taken. My meal concluded at the 3 hour mark. For a just-over 9 hour flight, this certainly didn't leave time for sleep. The cabin lights weren't dimmed until nearly 4 hours into the flight, and were back on full with 3 hours remaining. We all got about 2-3 hours to sleep. Ooph. I had a screaming child nearby, who never stopped. Sigh. 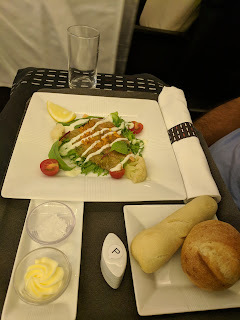 That all said, the food was actually quite good, likely some of the best I've had on a flight. Service was very attentive and friendly, once it started. I think I have a note for my future self, should I ever wind up on this route again: Eat dinner at the airport. They have some amazing options there (including like 6 different places with soft serve!). Get a nightcap, and maybe dessert, on the flight. And then go to sleep early. Maybe? 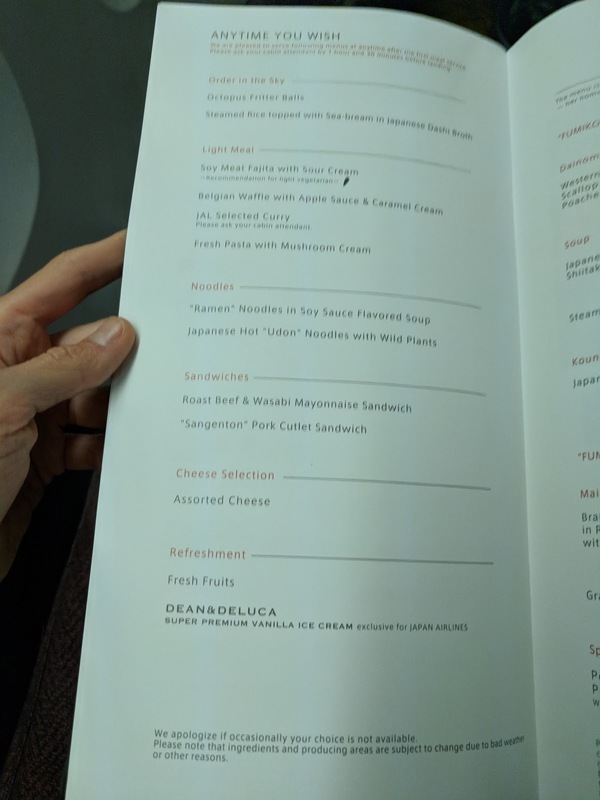 Since the seat and amenities were the same on this flight, I'll leave out those details this time around, and focus only on the meal service. As with my previous flight, for the main meal service, you have the choice of a Japanese or Western menu. 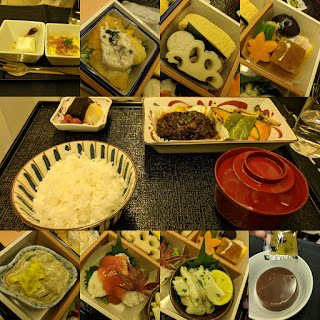 Both have the same amuse bouche, but different first courses, mains, and desserts (unlike my flight to Tokyo, where both menus had the same dessert). The Western menu actually sounded much better to me (nearly every course, including dessert), and I was pretty sick of Japanese food, but I had heard so many people say that you should order the Japanese menu when flying out of Tokyo. So, Japanese it was for me, but my companion got the Western, so I got to try most of it. Since I ordered the Japanese menu, I opted to try the sake. It was served in a glass, and I was provided my own little bottle of sake. It actually was pretty good, smooth, a bit sweet. 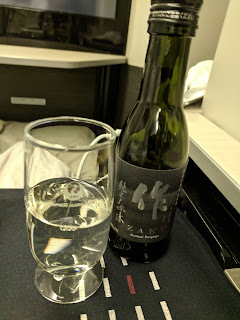 It made me realize I didn't drink nearly enough sake on my trip. "Sesame Tofu with Wasabi / Potato & Chanterelle Quiche"
The presentation of the amuse was good, two items, both in little bowls. 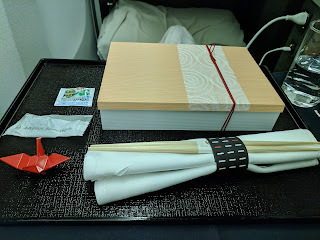 The sesame tofu had a pipette of soy sauce to drizzle over it, a package of wasabi on the side, and a little bamboo spoon to eat it with. But ... I didn't like it. 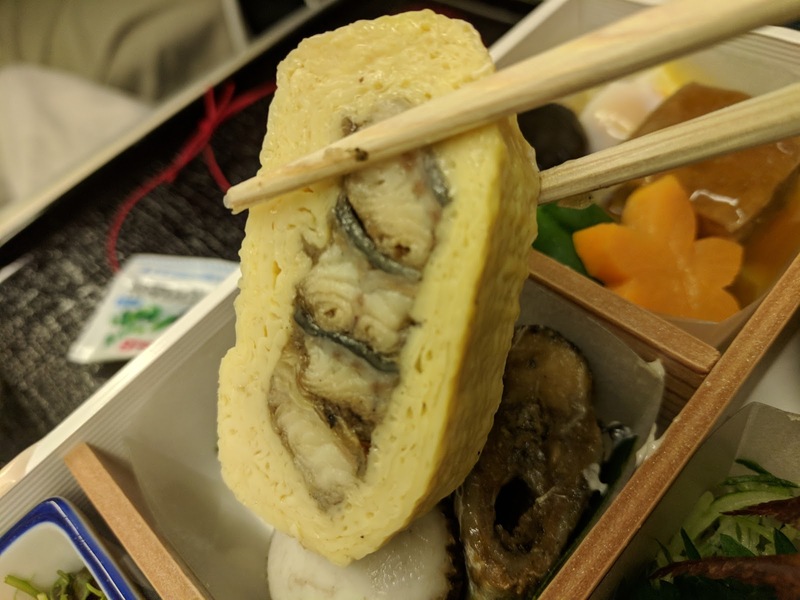 A very thick tofu with a strange flavor. The quiche was, well, chilled quiche. I never like quiche. It had huge chunks ok potato in it. It was hard and cold. On top was shreds of something that I think were actually a meat product? Overall, not successful, I didn't like either of these at all. Crimson Sky 〜Selection of seasonal colorful delicacies〜. Next up, my first course, all chilled, a ton of little dishes, served in a beautiful box. They really did a great job with presentation on this one. On the side, chopsticks, soy sauce, wasabi, and a chopstick rest. This was a mixed bag, some hits, some serious misses, but certainly interesting to eat. "Prawn with Japanese Style Tartar Sauce & Caviar." Three small prawns, tempura battered, with a big glob of mayo based sauce on top. The batter wasn't really good though, cold batter just isn't tasty. The shrimp wasn't too chewy though at least, but it was a bit fishy. The tartar sauce was very mayo forward, it didn't taste like much else. Overall, ok, but I hoped for better. The next compartment contained 4 different items. This wasn't great. The lotus root was crispy but pickled, highly vinegared. I had lotus root near daily while in Japan, so the novelty was gone, and this just wasn't great. I hated the Pacific Saury. Sooo fishy, kinda like a giant very fish sardine. 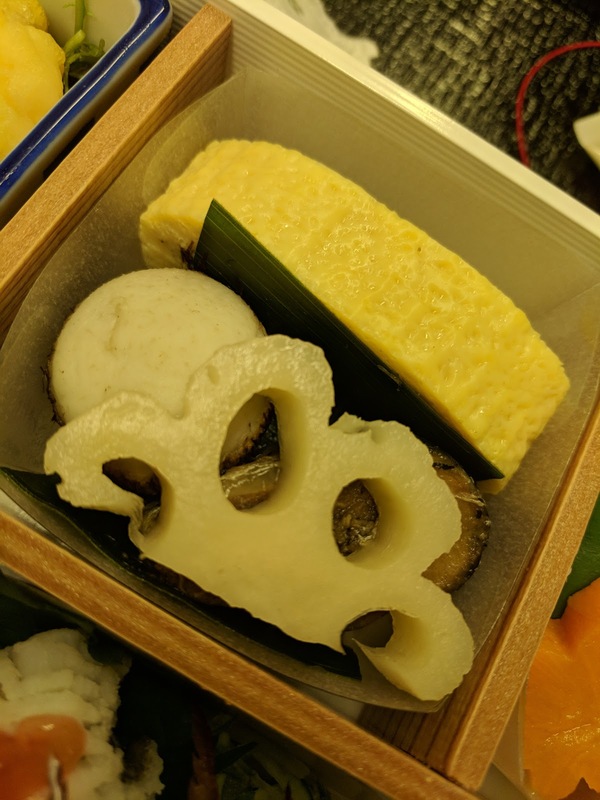 The taro was a different prep than I've had before; it had a slight skin left on it? Tender enough, but not particularly flavorful, and a bit boring. I dunked it in the tartar sauce. This was shockingly good. Highlight of the flight. Great flavors. The braised pork was tender flavorful bits of basically bacon. A bit crispy, quite tasty. The carrot was just a carrot, so that was a bit boring. I strangely loved the slow cooked egg. And I was just saying how sick of eggs I was, given that my breakfast buffet included eggs all the time, and I'm not an egg girl in the first place. But it was soft, the yolk runny and rich, and really, it was just tasty. I also liked the shiitake mushroom and super flavorful welsh onion. The "noodles" were a little bundle of slightly chewy noodles made from konjac. I liked those too. Not included in the description was the block of tofu, again, actually good, as it soaked up tons of the sauce. Ahh, the sauce. It was crazy good. Slightly sweet. 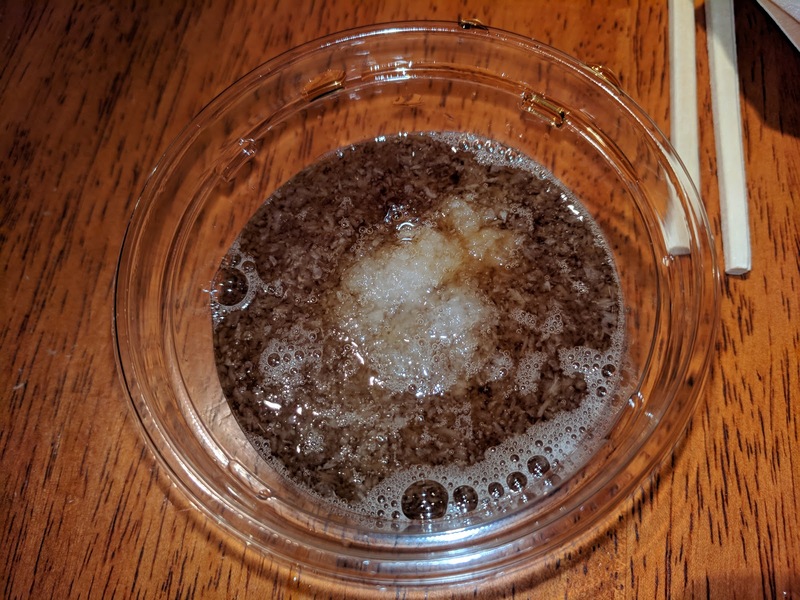 I think there was soy sauce, sugar, and some other things. I really loved this dish, and devoured it. It was a shocker to me, as I thought it would be the least interesting dish. "Vinegared Persimmon & Vegetables with Sesame Cream." This was ... strange. As I expected given the ingredients. I have no idea what any of the veggies, all in shreds, were. The sesame cream was almost good, but actually just was too strong for me. "Poached Pike Conger with Pickled Plum." 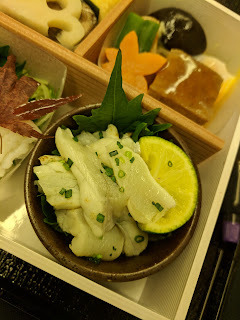 The poached pike conger (eel) was actually better than I expected. Not fishy, not chewy, just very mild (and a bit boring). The pickled plum sauce on top was tart and interesting. It was served on top of spiraled crispy cucumbers, which I found really refreshing, particularly when dunked in my assorted sauces. The kelp flavored pufferfish was awful though. Incredibly chewy. Lime garnish. Marinated Salmon with Yogurt Sauce / Petite Ciabatta / Sweet Potato Petit Bread (Western). The Western starter was actually quite good, and nothing like the short description implied. The marinated salmon had plentiful dill to enhance the flavor, roe on top, and barely a drizzle of the yogurt sauce. It was flavorful, mild, and really quite nice. Served on top of some salad. The breads on the side were cute, but lackluster, a bit chewy in a stale sense, and the sweet potato one didn't taste much like sweet potato. The butter and generous bowl of salt on the side were great though. Overall, actually a very nice starter, clearly the better dish. 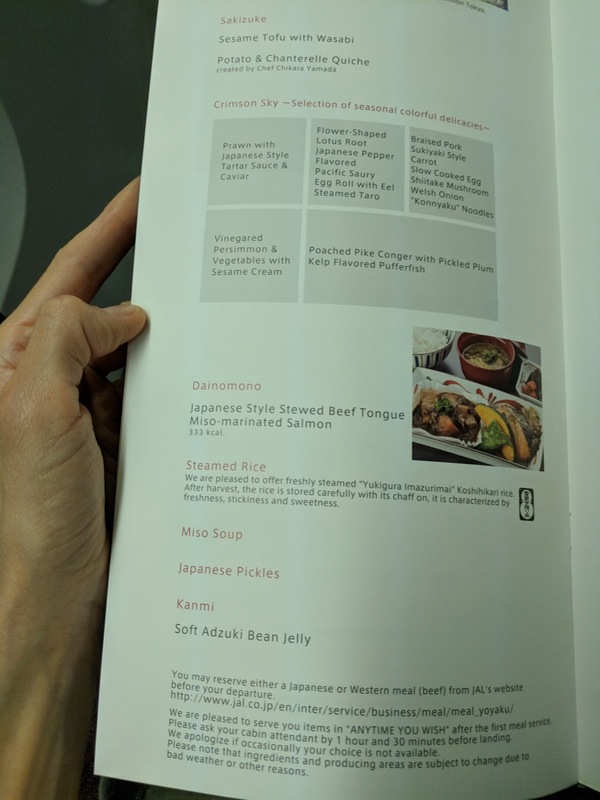 "Japanese Style Stewed Beef Tongue / Miso-marinated Salmon / Steamed Rice / Miso Soup /Japanese Pickles." The main dish (and all its sides) was also actually quite good. It was also a ton of food. Unlike the Western menu, with a choice of beef or seafood, you get both. And that was *after* the zillion course "first course". Beef Tongue / Miso-Marinated Salmon. The beef tongue I expected to skip entirely. But, the sauce was quite flavorful, a thick, rich onion sauce. I really liked the sauce. And the beef tongue? 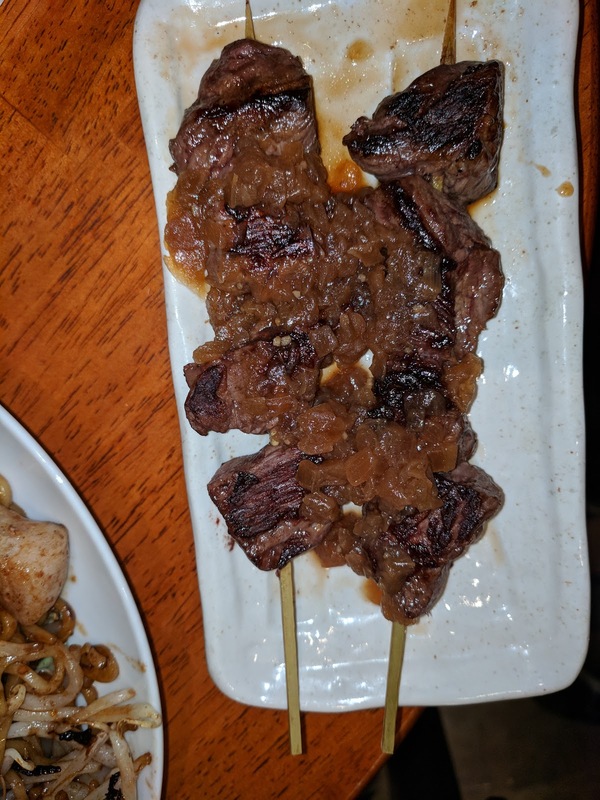 It was ridiculously tender, it separated easily with chopsticks. It seemed like it had been braised for hours. Really quite impressive. Also in the mix were various vegetables, carrots, onions, potatoes. I guess this was basically Japanese beef stew? The salmon was even better. I adored the miso sauce on top. The salmon wasn't fishy. It was cooked medium-rare, as I like it. It was nice fish. 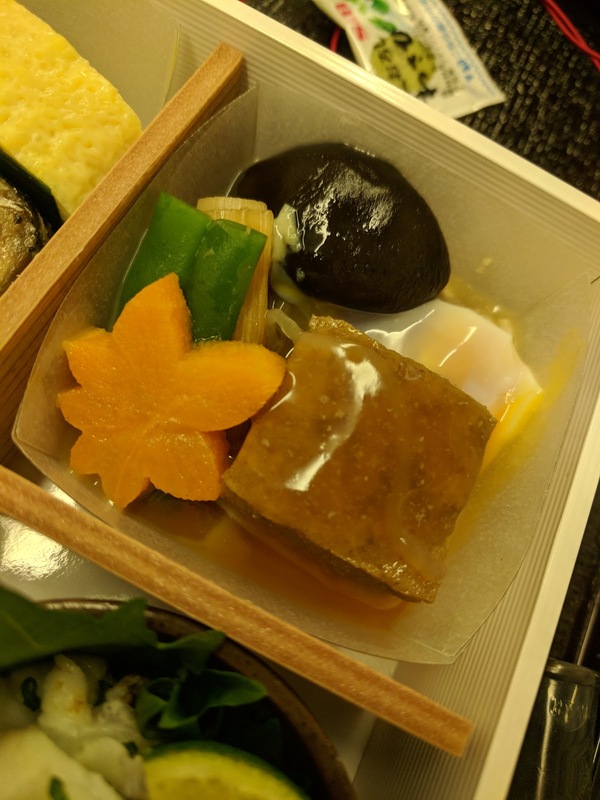 It came with assorted mushrooms (fine, meaty), green beans (fine, refreshing), and a chunk of Japanese squash (dry, cold). 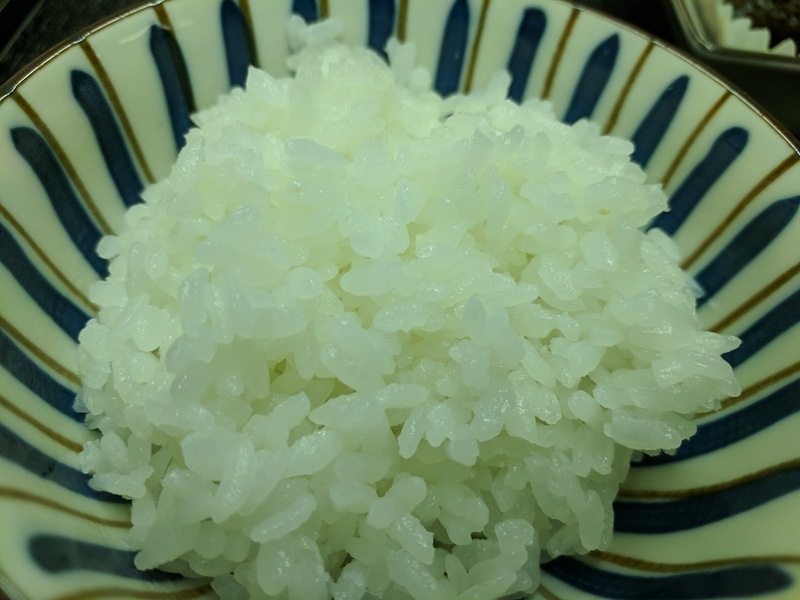 The rice I skipped since it was just rice. The miso soup was a thicker base than usual, and it had huge slimy chunks of eggplant (?!) in it, but the bits of tofu and green onion were quite good. And finally, the pickles. 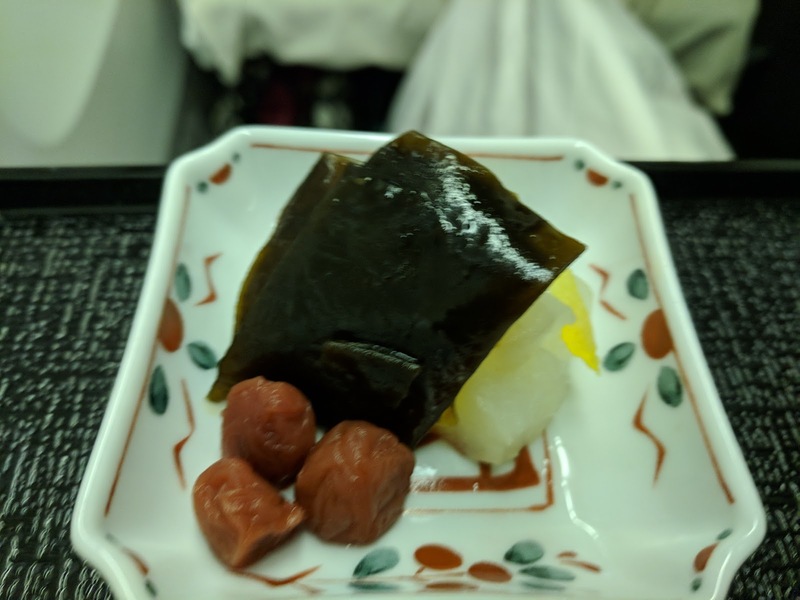 Tiny pickled plums, some kind of seaweed in sauce, and something crunchy (daikon perhaps?). These were actually quite good too. I wished I wasn't so full, as this was actually quality food, great flavors, well prepared. Kanmi: Soft Adzuki Bean Jelly. 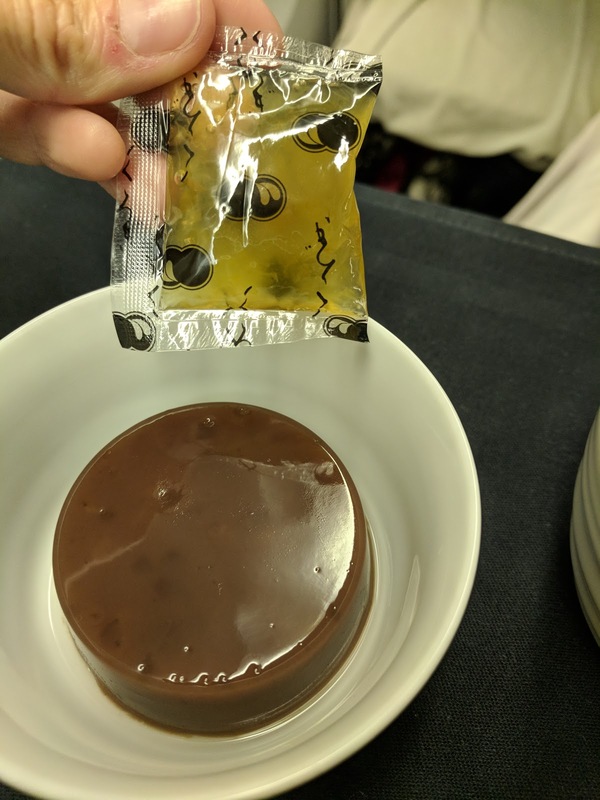 The dessert included with my meal was the red bean jelly, with a yellow plum jam on the side to top it with. It was actually ok. Nice texture jelly, with bits of red bean inside it. Good flavor, a bit sweet, not too sweet, not too savory. I didn't like the plum jam, it was too tart and too sweet, but it also wasn't needed. 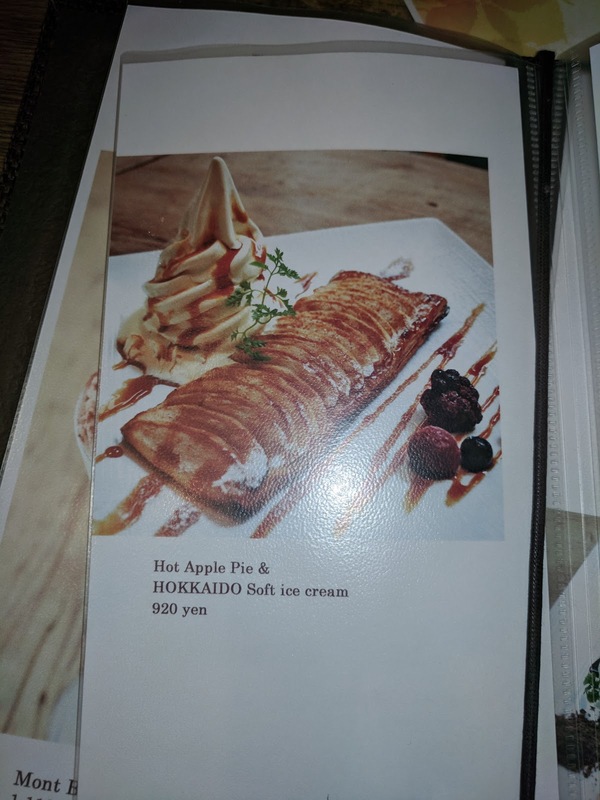 If this was the only option for dessert, I would have been fine with it. I actually wanted the Western dessert, so I was quite glad when my companion decided to go to bed before dessert was served, and I could just have his. The base was a chocolate sponge cake, which I mostly avoided. But the rest was cream with chunks of chestnut in it. It was pretty tasty, and, given how chestnut crazy Japan was the whole time I was there, so I was in the mood for more chestnut. The top was dusted in cocoa powder, which I didn't care for (and also didn't want, because caffeine). 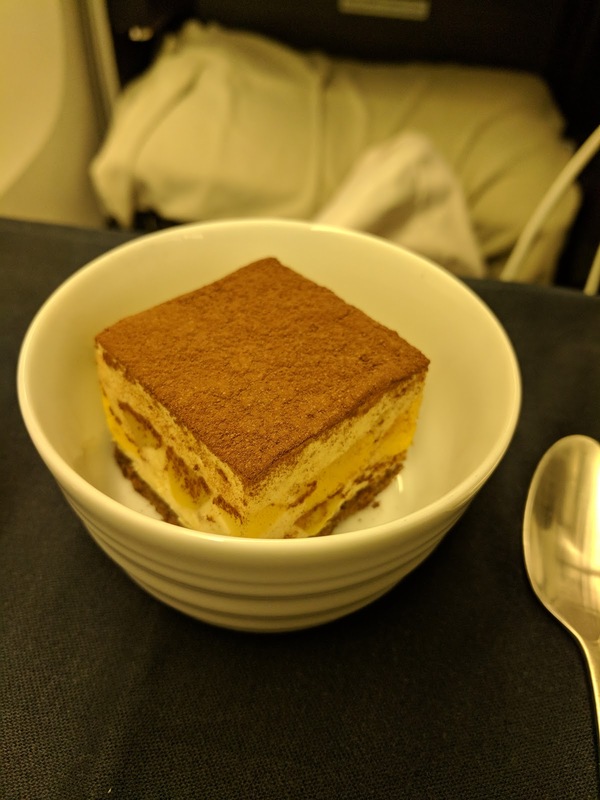 But the cocoa flavor was quite strong, it took over the more subtle flavors of the tiramisu. Still, overall, a decent dessert. The Anytime you wish menu had many tempting options too, and was more extensive than our previous flight. 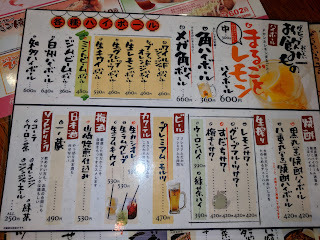 And finally, a choice of Western or Japanese Set Menu. 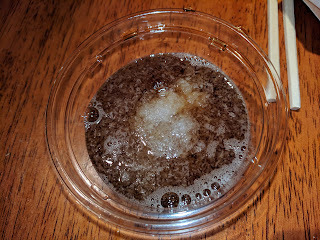 Japanese Clear Soup with Shiitake Mushroom & "Fu"
Since there is no formal second meal, you can order whatever you want, be it some ramen, curry, a sandwich, a full set menu, or, in my case, um, waffles and ice cream. This seemed the most fitting for "breakfast" since there wasn't any real breakfast items. 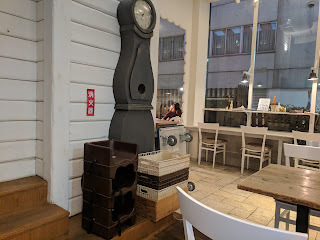 That said, the last chance to order was only 3.5 hours after our dinner had finished, and that was not exactly a small meal, so I wasn't remotely hungry. But who am I to pass up waffles and ice cream? I mean, really? I'm glad I didn't. This was all delicious. 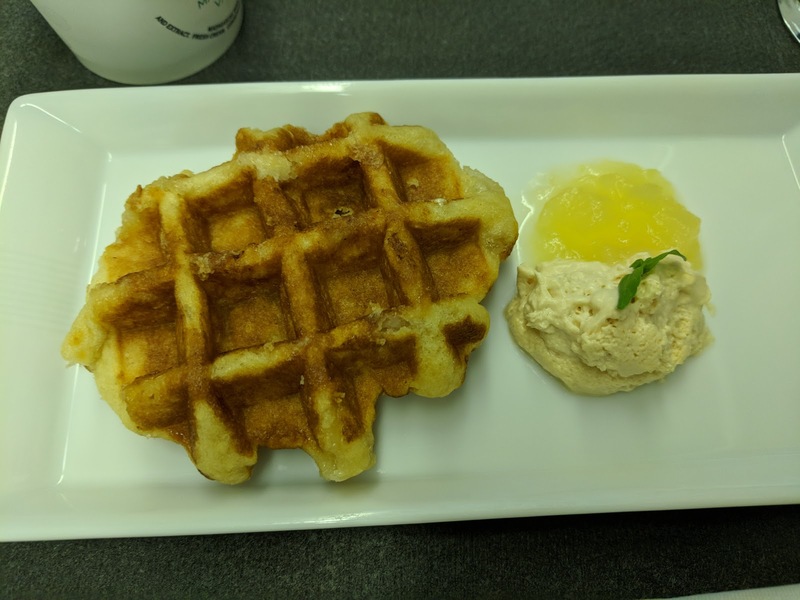 Belgian Waffle with Apple Sauce & Caramel Cream. The waffle was good. Very good. Borderline amazing. 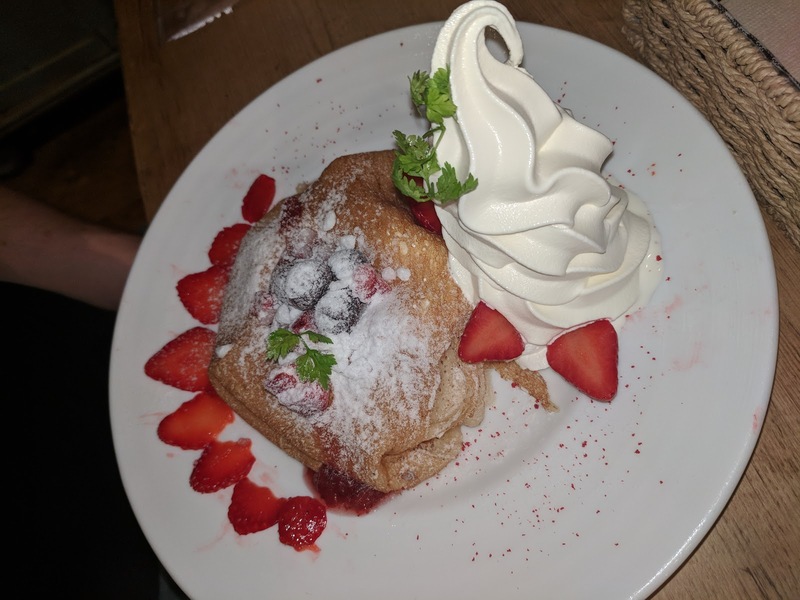 It was a true liege style waffle, huge chunks of pearl sugar inside. Yeasted, lofty, great flavor to the base. The only reason I say it was good and not amazing is that it needed just a few more minutes in the oven. It wasn't that hot, and was a tad bit soggy on the bottom. But that said, it was still very, very good. They got a good product. On the side was a chunky apple compote that I didn't care for, and an AMAZING caramel cream. Sweet, fluffy, absolutely delicious. I could have eaten a bowl of it. It was perfect to dunk my waffle in. 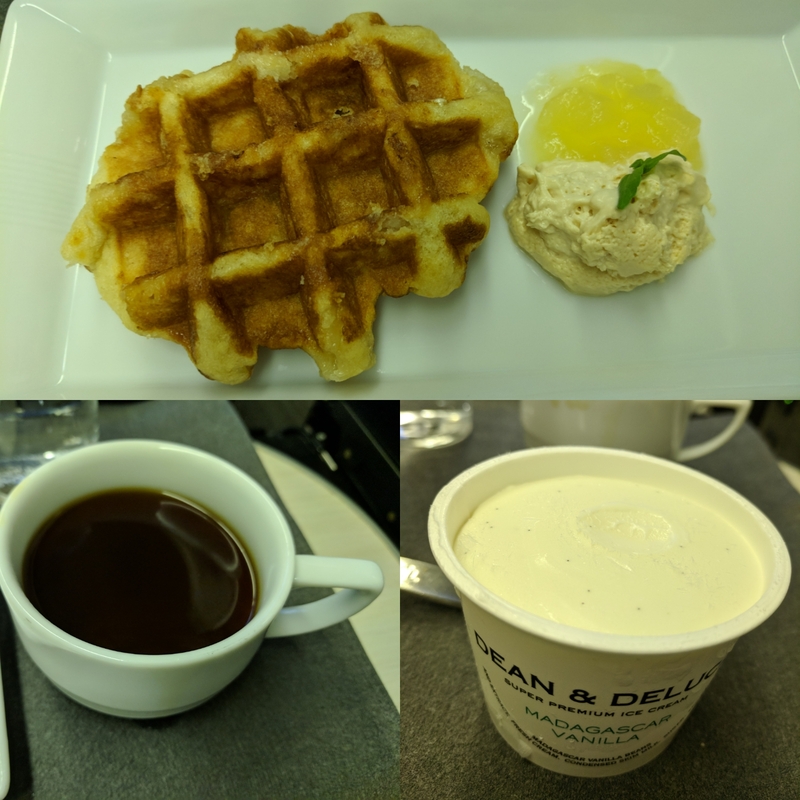 I devoured this, even though not hungry, and honestly, likely would have ordered a second one if there were more time remaining in the flight. 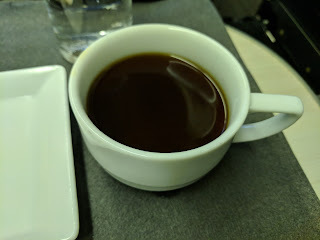 On my previous flight, I opted for decaf only since I was arriving at night, but on this flight, I was able to order the regular. It was very, very good. Super smooth, full bodied, nice flavor. Really, perhaps the best coffee I've ever had on a flight. 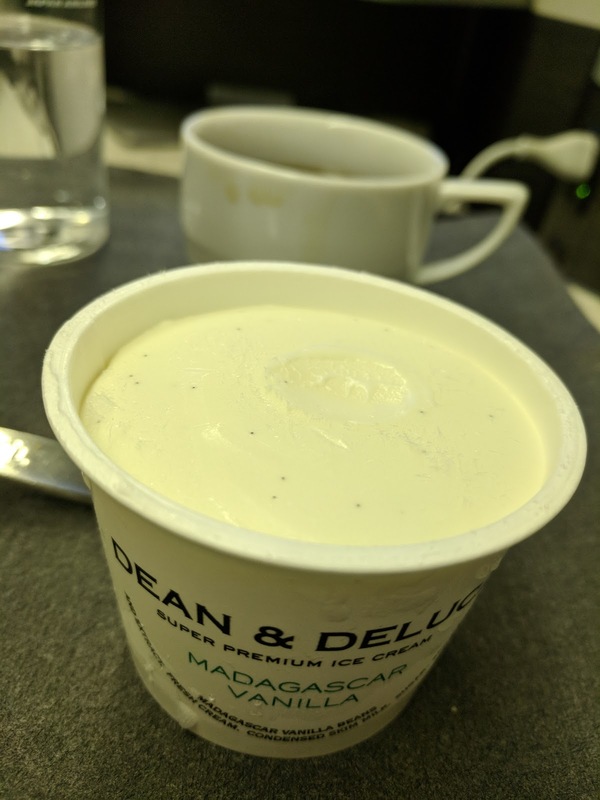 Dean & Deluca Super Premium Vanilla Ice Cream. The ice cream was wonderful. It was served very cold, so it took a long time to become soft enough to actually eat, but, the quality was very, very high. Super rich, amazing vanilla flavor, clearly, a premium product. 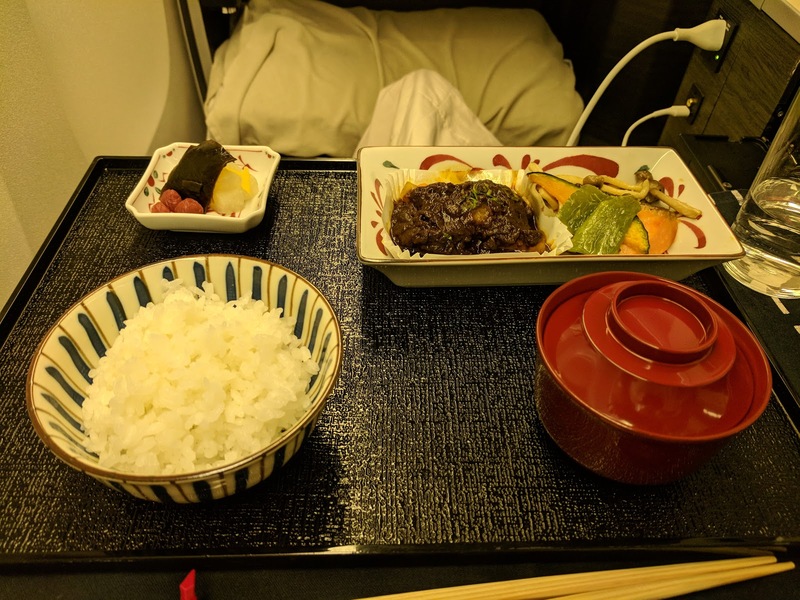 My 2017 trip to Tokyo was quite different from my last Michelin-star studded trip. 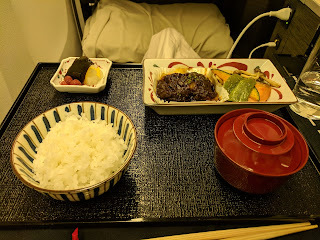 This time, we focused on casual dining, unique Tokyo experiences, and niche items we don't get in the US. This lead us to places like 7-Eleven for onigiri and salads in pouches, to a tiny restaurant in Tsukishima to get monja where we were the only non-Japanese, and to get ice cream stuffed melonpan from a booth on the street (reviews all coming soon!). We were all about cheap eats this time around. 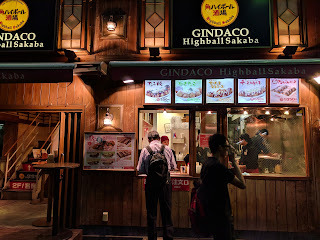 Which lead us one night to Gindaco, for takoyaki. 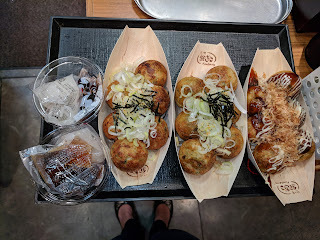 Takoyaki has long been on my list of food that I wanted to try more. 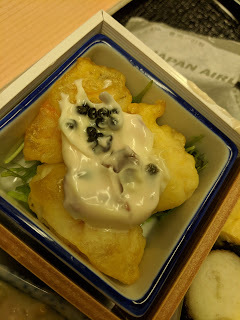 For the unfamiliar, these are fried little fritters with octopus bits in them, usually topped with sauces like okinomiyaki, e.g. sweet sauce and mayo. Fried, seafood, and tasty sauces? Yes, please! I was in Tokyo for work, and one night we had a catered reception with takoyaki that were insanely delicious. If catering could do such a great job, it made me really curious to see what the "real" thing could be like. 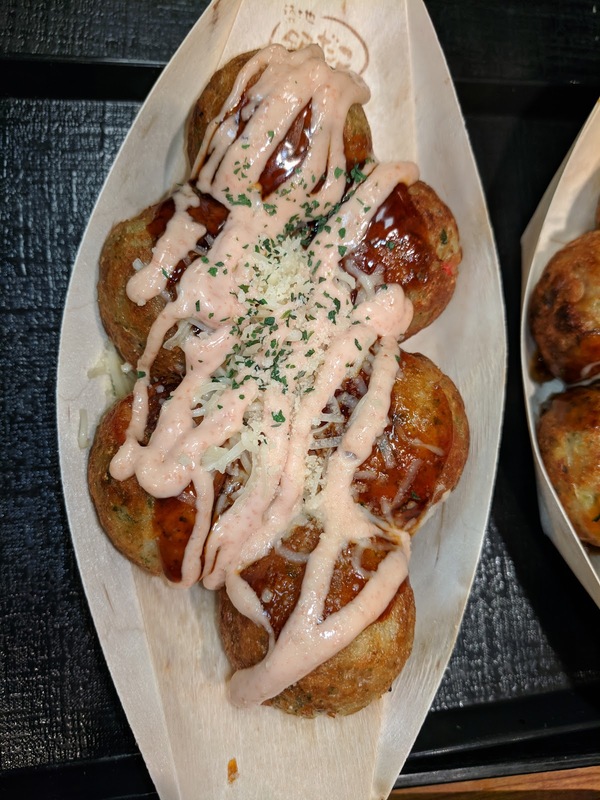 So I decided we should seek out legit takoyaki, which is where Gindaco comes in. 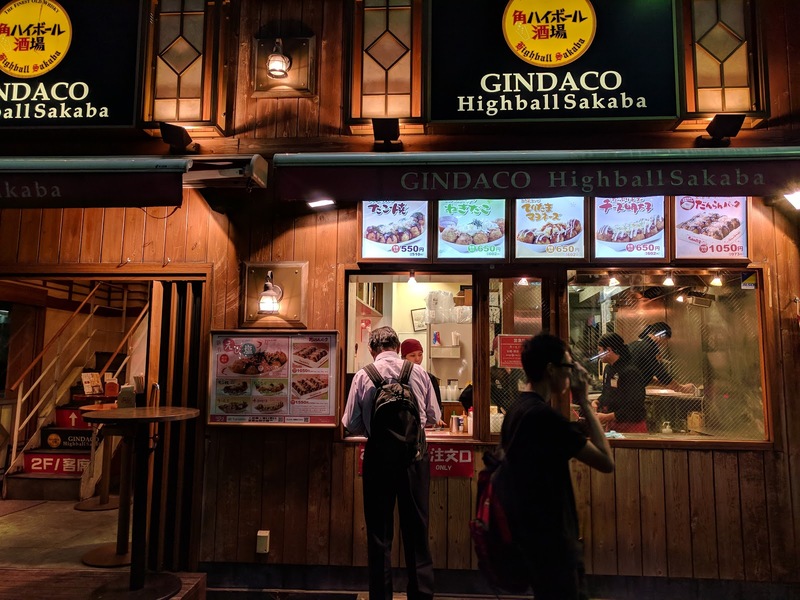 Gindaco is a huge chain in Japan, famous for takoyaki, with a serious Tokyo presence. I read somewhere that they have 100+ locations in Tokyo alone! 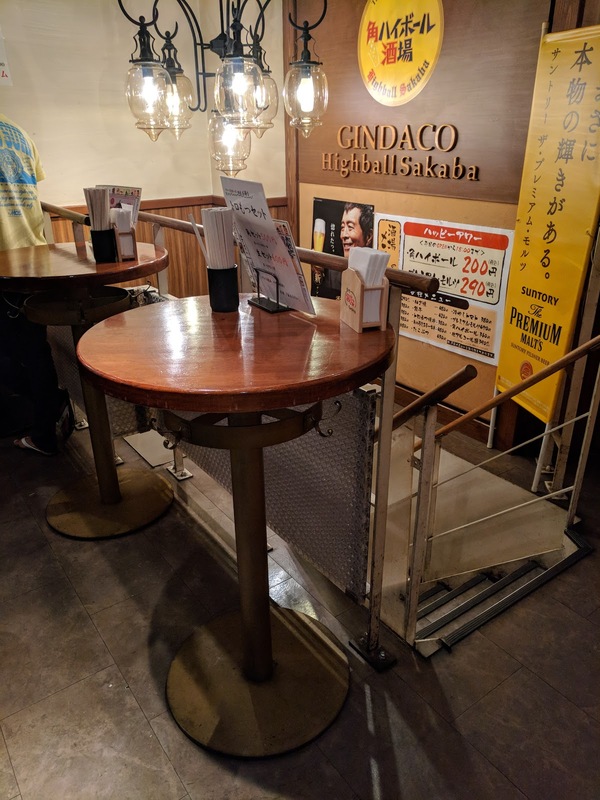 Some locations are smaller, just takeout windows with no seating and a menu of just takoyaki, whereas others also feature drinks and have areas to sit. I went with a group of 6, on a Friday night, early evening. In addition to 4 types of takoyaki, we also sampled other appetizers, and their signature drink: highballs. Let's just say, this was an "experience", but not one any of us will repeat. I greatly preferred the takoyaki at our event the night before. We made up for it by getting incredible soft serve dessert platters at Silkream immediately after. 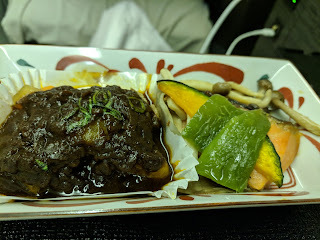 We headed to one of the bigger locations, right near Shibuya station, with an extended menu, full drink menu, and, what we hoped would be seating for our group of 6. 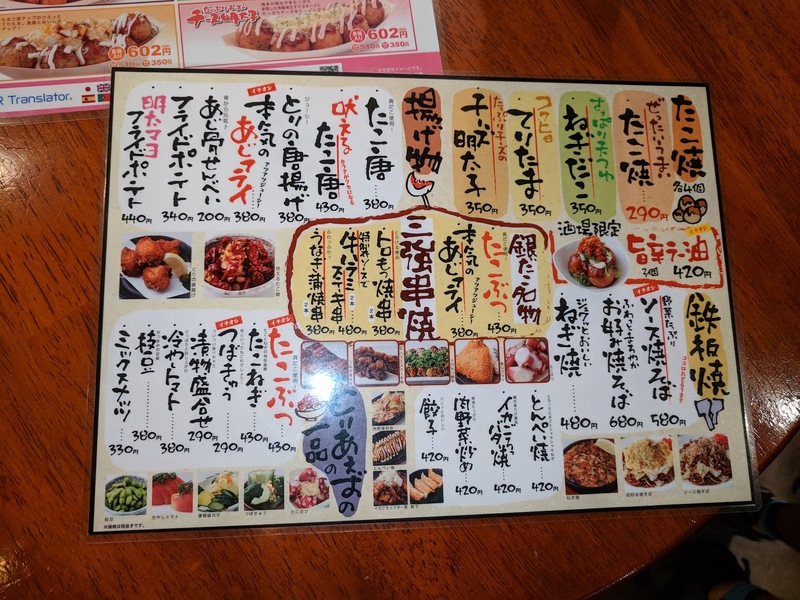 The exterior features a ordering window where you can order takoyaki, for takeout or devouring right there at the high standing tables on the sidewalk. The full menu is not available outside, but they do a very steady business, like most of the locations. Through the windows, you can also watch them cooking the takoyaki, in the specialized molds. Inside is another ordering station, where you can order for dine-in. 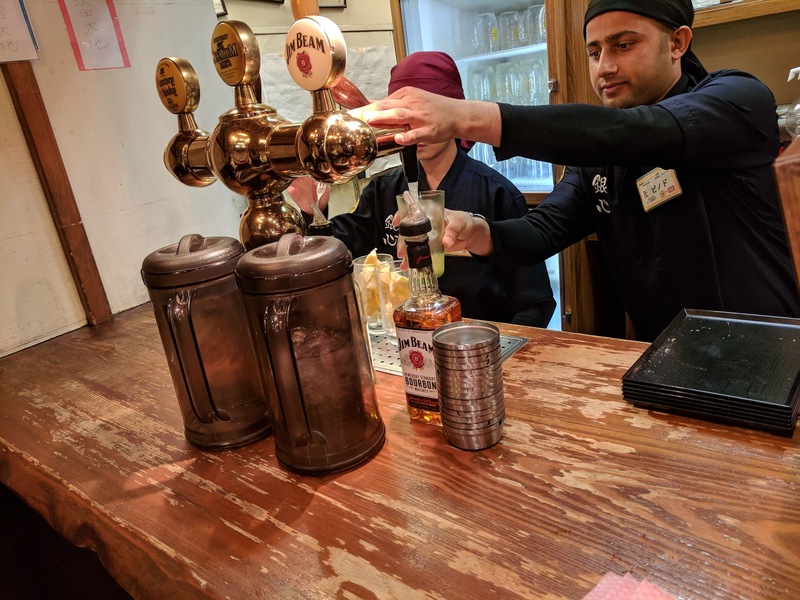 The staff here will plate up your takoyaki on the spot and hand it over on a tray, and get your beverages. If you order anything else, it will be delivered to your table. There is no seating on the level with the ordering counter, basically just space to order and get out of the way. Seating is all upstairs, along a counter, and around a few high bar tables. We entered at about 5:55pm, and went upstairs to check on seating. There were a few tables available, and we started pushing them together. But then things got strange. All of a sudden, staff members swooped in, and took away all the bar stools. We were confused. Did we do something wrong? Was our group of 6 so problematic that they needed to take away all the stools from us? The answer was no, but at 6pm, on the dot, the place transforms into standing only, to handle the dinner crowds. Well, ok then, we'd enjoy our meal standing around tables instead. The menu at at Gindaco locations features the takoyaki, available with different toppings, in orders of 4, 6, or 8 (or 16 or 24 if you really wanna go crazy). Luckily, they had pictures of each type, although even that wasn't really enough info for most of my group, who had no idea what we were even there for. Luckily, I had done my research, and knew what each was. There were 5 varieties available, including a seasonal "shrimp salt" version. We opted to try the 4 others. Since this was a larger location, a full menu of other appetizers and dishes was also available. Again, some pictures to be helpful, but no english, and we could only figure some of it out. I asked about an English menu, but alas, not available. Google translate on our phones also failed us. What we did figure out was a few chilled items (edamame, pickles), some skewers, gyoza, and a couple noodle dishes. 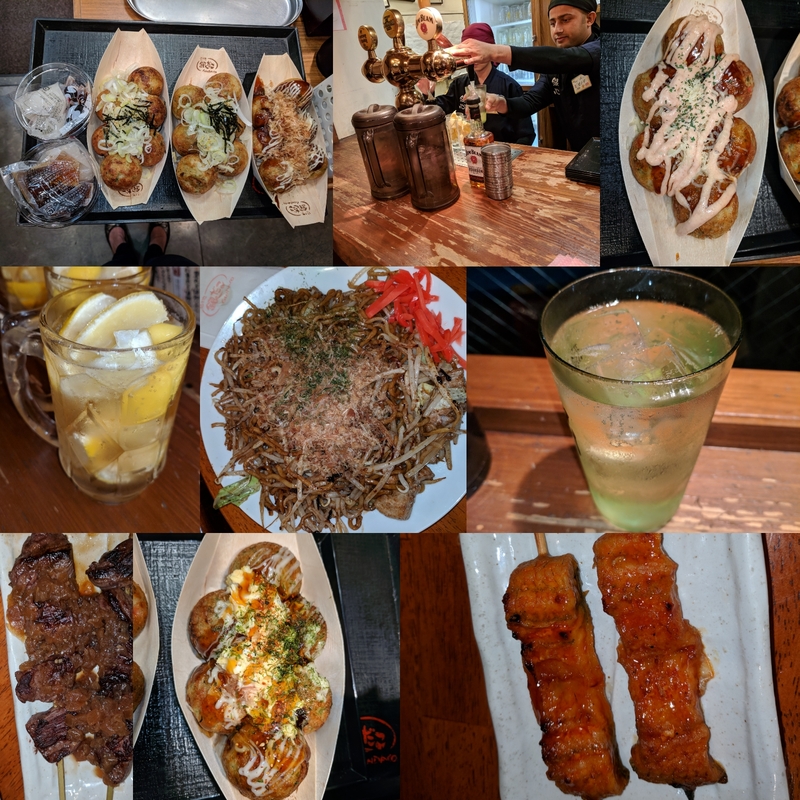 Some of my group really wanted to try yakitori (skewers) and yakisoba (noodles), so, we opted for some of those too. 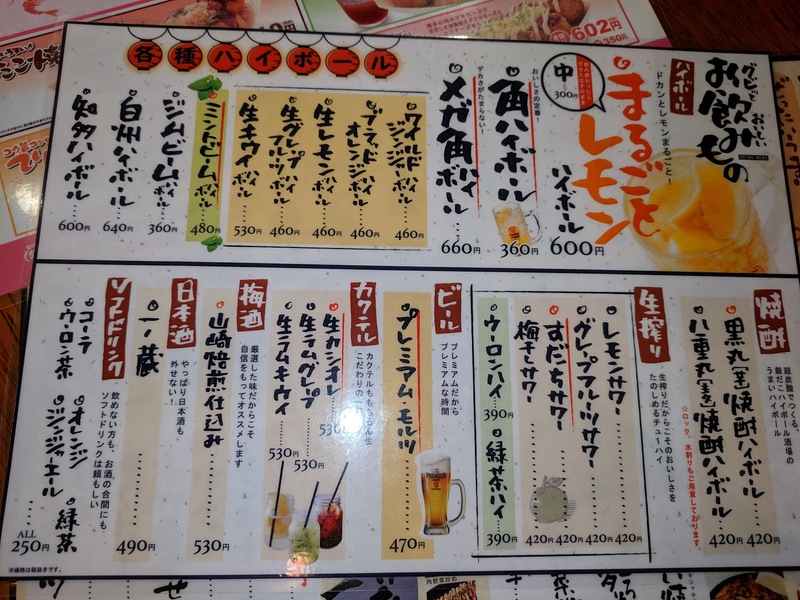 The drink menu was the least useful. We think there was beer, shochu, plum wine, perhaps some soft drinks, and, the highballs. 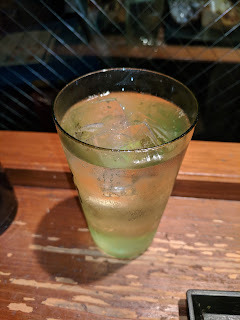 Since highballs are what they are known for, that is what we all got. 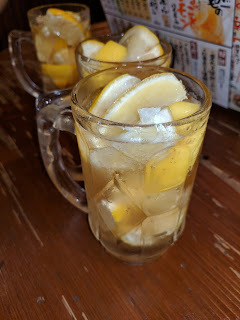 The guys in my group all opted for the classic highball. Big steins, filled up with ... lots of lemons and ice cubes. It turns out, the lemons themselves were frozen too. That was novel. But otherwise, uh, these were just watered down whiskey sodas. I guess they go well with fried food? Mine was served in a tall glass, not loaded with lemons. It was greenish. Why did I have something different? Well, I was trying to ask about what the different drinks were, or if the guy taking our order had a favorite (he really did seem to not hate trying to speak English to us). He told me this one was the ladies like. This lady did not like it. It was very harsh. Not a smooth drink. I think just some low end whiskey, soda water, ice cubes, and ... mint? I'm still not sure. 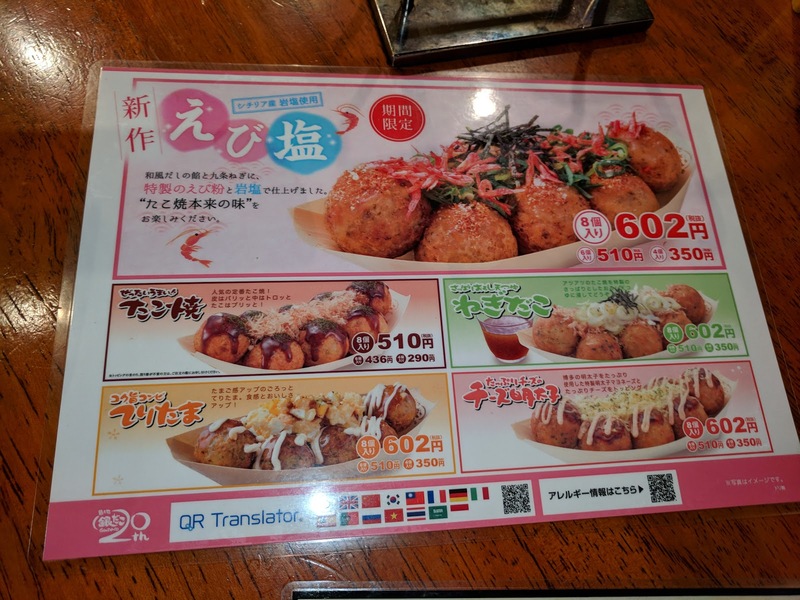 Once we ordered, trays started filling up with boats of different types of takoyaki. We were also provided with two little plastic bowls, soy sauce, and grated diakon. "Drizzled with signature Gindaco sauce, topped with dried green seaweed and dancing bonito flakes." On the right is the original style, coated in takoyaki sauce (sweet sauce, much like okinomiyaki), plus mayo sauce (yup, just like okinomiyaki), bonito flakes, and green laver. 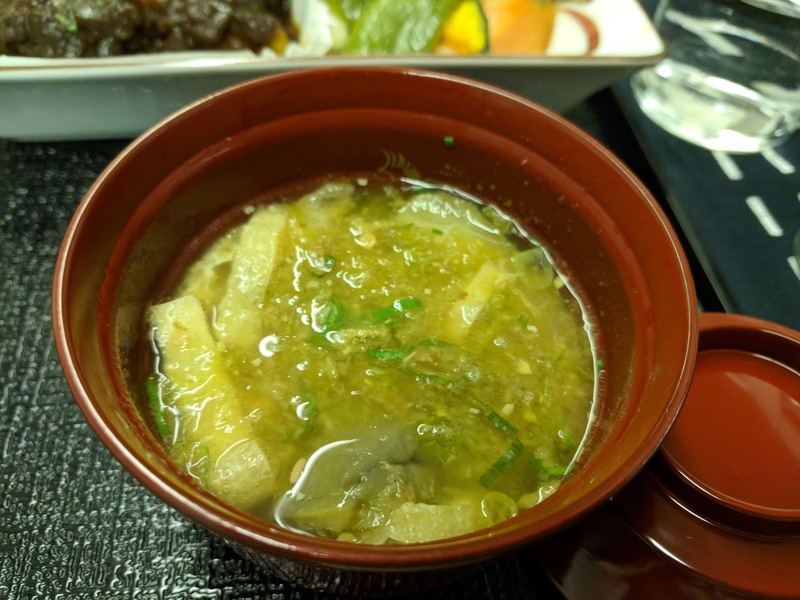 "Served with tempura dipping sauce, topped with white radish, green onions, dried green seaweed, and danicing bonito flakes." The other two orders were negidako, the same balls, but no sauce, topped with green onion. I guess these were supposed to have bonito too (per the English menu I later found online, but, ours did not have). I'll start with the positive. They were very fresh and hot. As in, uh, crazy hot inside. 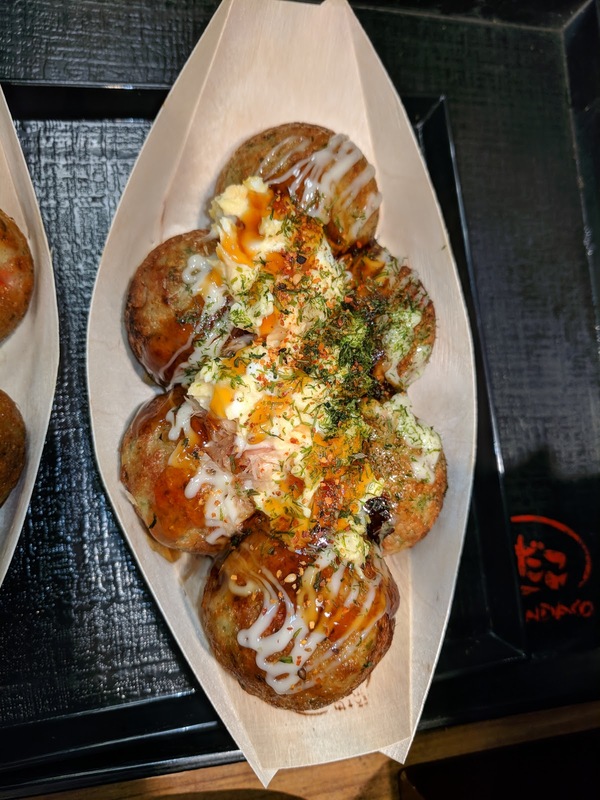 Even though it took us time to bring our food upstairs, re-arrange ourselves around tables so that we could all reach the takoyaki boats, I still nearly shrieked as I bit in, as the molten hot filling made contact with the inside of my mouth. 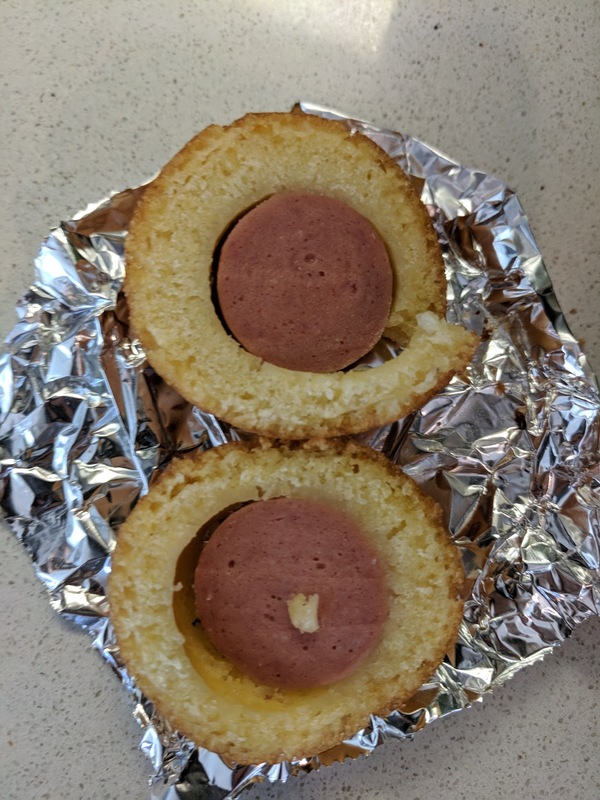 The balls were crispy on the outside, soft inside. And filled with bits of octopus. 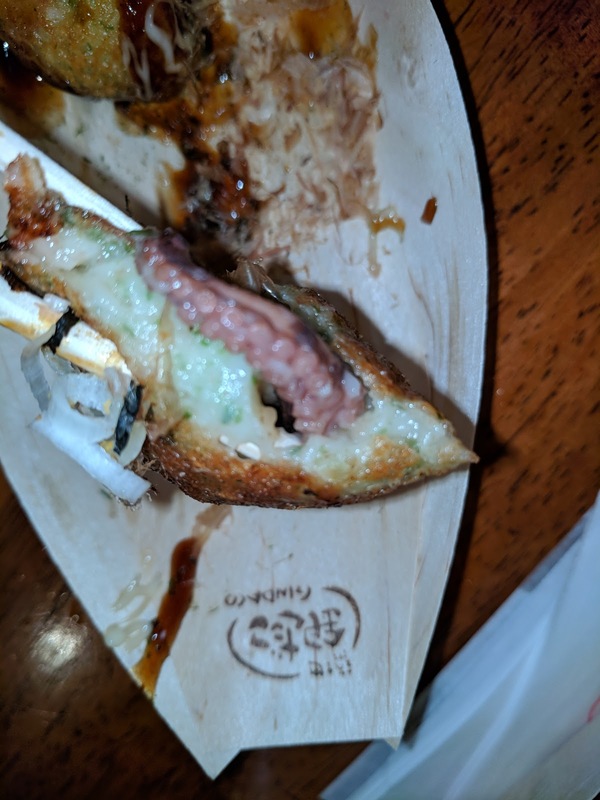 Very chewy octopus. 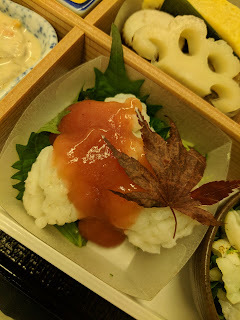 The negidako was certainly the least interesting, and most in need of the dipping sauce, although, I do like green onion, and it added a bit of freshness. 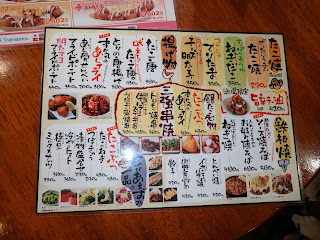 The traditional style tasted, well, like okinomiyaki toppings. Sweet, creamy, a bit fishy. Nothing really revolutionary. Soy sauce and grated diakon. The soy sauce and grated daikon were for the negidako, but we kinda used them for everything. I kinda really liked it, or perhaps just wasn't satisfied with anything else, as I may or may not have drank the rest of the sauce dishes when someone dared me to. "Served with spicy cod roe mixed into Japanese mayo and soy sauce, topped with mozzarella cheese, dried parsley, and Parmesan cheese sprinkle." Things got more interesting with the "cheese" topped one. 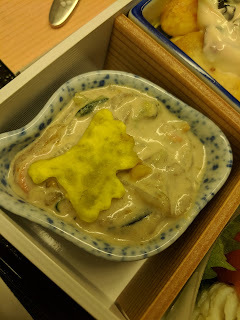 It had the same base sweet sauce, then, uh, shredded cheese melted on, then tons of creamy sauce, different from the sauce on the original version, as this I guess was cod roe based mayo? This version turned out to be my favorite. I somehow really liked the cheese actually. And the very generous dousing of the flavorful mayo didn't hurt. "Drizzled with premium Teriyaki sauce and Japanese meyo, topped with freshly made egg salad, dried green seaweed and dancing bonito flakes. Sprinkles with Japan's famous 7 spices." And more interesting yet, topped with the sweet sauce and mayo from the originals, but also with ... egg salad on top? And a bit of extra spices? Ah, Japanese and eggs. I ate a lot of egg on this trip, not just because my hotel breakfast made me order eggs every day in addition to the buffet, but because egg is just everywhere. Like in the egg-four-ways sandwich from Lawson we got, after hearing all about how great the egg sandwiches are there (stay tuned for that review). And of course, tamago at sushi restaurants. But anyway, uh, yeah, chunks of egg salad, warmed up by the balls? This was strange, and not particularly good. I tried, but clearly failed, to get a decent photo of the inside of a ball. But hopefully this gives you an idea, soft fritter shell, actual bits of octopus inside. I liked how crispy the shell was, and the soft nature of the fritter, but the chewy octopus just didn't do it for me, no matter how many coatings I slathered on top. The rest of our order, skewers and noodles, was delivered to our table about 10 minutes later, on real plates. I didn't try the random skewers we pointed at on the menu, as others wanted them, and we managed to only order two. They thought they were beef, and they didn't seem like hits. Nor did I try the eel skewers, again, just a pair, and not hits with the rest of the group. "Japanese soba cooked to order with 2 types of Japanese sauces, served with cabbage, chicken, dried green seaweed, and dancing bonito flakes." 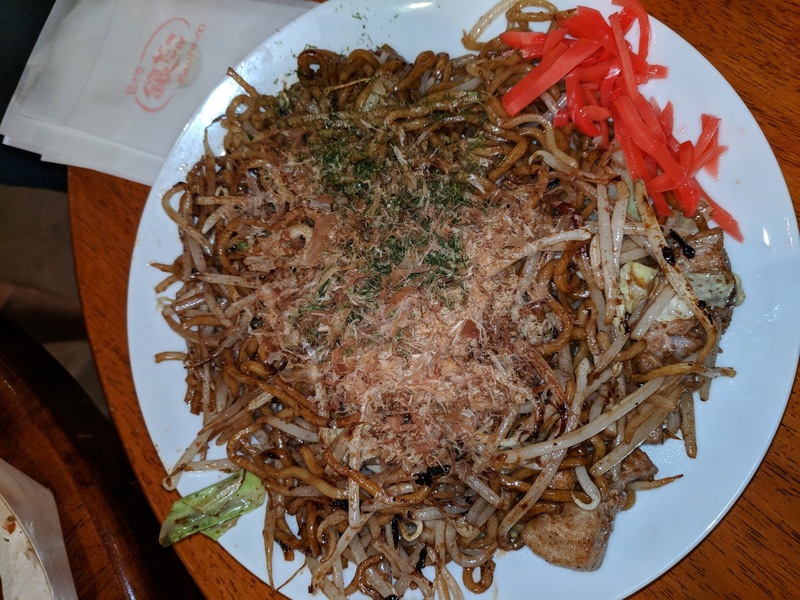 We also got a noodle dish, yakisoba. 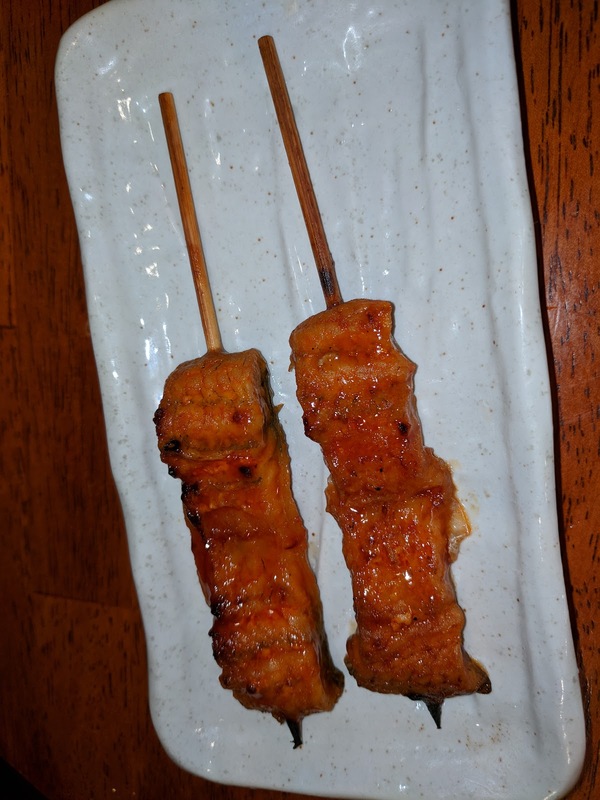 I tried a few bites, but, again, it ust wasn't interesting to me. Greasy noodles, with bean sprouts, a soy based sauce, and bonito flakes on top? Meh.